I was completely unaware until a year or so ago (written in 2012) that John William Joseph Vecqueray, the founder of Hillbrow School, was a Prussian by birth, though a Wallonian by ancestry. Had I known this, I might have been more keen to learn German. For me, as for so many others, German was simply a nasty gutteral language used by those horrific Nazis. German was not even on the horizon when I was at school, though others around me were studying it at Shrewsbury, and I remember them carrying around their textbook, with its German title in Gothic script. Of course I was a little puzzled by the fact that so many of the composers I admired were Germans, and indeed this was eventually what led me to learn the language. In 1967 I went to live in Germany (see Episode 12 of my autobiographical sketches) though by the time I returned to Britain the following year I still wasn’t fluent, having spent most of my time working for the Canadian Airforce and speaking English. But I had acquired quite a good passive knowledge of the language, and this became acctive very quickly when I went to evening classes for a year in Watford and passed O level with a grade A (as with French at the same time). The big step forward came much later, in 1976, when I met Angie in Vienna (see Episode 17). As she didn’t speak English when we met, our relationship was for a considerable time conducted in German, and I soon became quite proficient. In 1990 I chose to write my MA dissertation on Freud’s Debt to Goethe (see Box 14 under Mass Observation). This involved getting to know Faust Part 1 very well, as this is where most of Freud’s quotations from Goethe came. I bought both a tape and a video of the play, and would listen to the first whenever I was out alone in the car. I can’t, like my friend Anya, quote long passages, but when she does so every word is familiar to me. On the strength of this disseration, which my supervisor believed would have been quite good enough for a doctorate if enlarged, I was accepted to do a doctorate in the German School at the University of Sussex under Professor Edward Timms. My subject, suggested by him, but enthusiastically agreed to by me, was to be Wilhelm Stekel, an early psychoanalyst collaborator of Sigmund Freud who had fallen into obscurity. 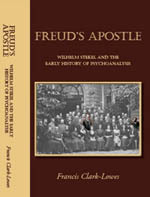 I already knew something about Stekel because one-time patient and adherent of his unorthodox school of psychoanalysis, Fritz Wittels, had written an unauthorised biography of Freud which I had quoted extensively in my MA thesis. Wittels not only made a strong case for the influence of Goethe on Freud, but also praised Stekel so much that Freud felt constrained to write in the margin of his copy ‘zu viel Stekel!’, ‘too much Stekel!’ By that time Freud had come to hate Stekel. My research on Stekel involved extensive work in Vienna as most of the material I needed had not been translated into English, and was not therefore available in Britain. In particular I spent many hour trawling through the Neues Wiener Tagblatt, a popular daily newspaper in Vienna up to the time of the Anschluss, for feuilletons written by Stekel. While in Vienna I stayed in an apartment at the top of Berggasse 19, on the Mezzanine floor of which Freud had lived, and where the Freud Museum is now to be found. They used the apartment in which I stayed as a store area, and let it to me at a very reasonable rent. It was, incidentally, in the next building, Berggasse 17, that I had met my first wife, Angie (see Episode 18 of my Autobiography). Without my taking any firm decision on the matter, my doctoral studies came under the umbrella of the Centre for German Jewish Studies (see Box 18, Folder 5 under Mass Observation), for which I worked as a research assistant for a while. Whatever difficulties I may later have had with this organisation, I am very grateful to it for the translation and editing work which came my way as a result of my involvement with it (see Publications and Translations). Translation is a demanding discipline. You need to check everything about which you have the slightest doubt, even though in most cases you’ll find that your instinct was right. You learn as much about your own language as well. I’m sure my English style has been strongly influenced by the effect of searching for the right phrase to translate an idea in German. Particuarly challenging is the translation of poetry. Both of my most recent translations contained poetry, and though I could simply have edited this out (I edited as well as translated both A Grandfather Remembers and Memories from Nine Decades) I thought this would have detracted from the value of the work. In effect a translated poem if a new poem inspired the idea of the original, and perhaps my discovery of a poetic side to myself also derives from this exercise.